New to site, new 1977 Hardtop for me! Welcome aboard! If it was "TNT" you would see the decals, or what's left of them on the side of the wheel house. They were on it when it was at Yachtfish. If it is, we are very familiar with the owners and the boat. We currently still own a 77' Express cruiser, and are the original owners. 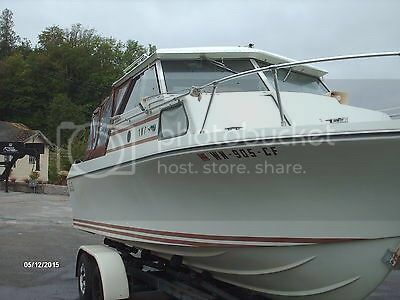 Ours was originally powered with the 233 and it was a great engine/outdrive for the boat, we eventually had to re-power after we just wore the thing out, long story, but our 23' arguably has been more places than any GP out there, including a 2 year trip on the intercoastal waterway. I hear a lot about the wood stringer thing, but we're still using ours with thousands and thousands of hours and I think if the boat was taken care of, with no water intrusion, I wouldn't give it a second thought. TNT was well taken care of and with proper care, will give you many years of reliable service! And to answer your last question, they got out of boating due to age and health issue's. Thank you so much for the info and good to hear about the previous owners as well as your experience with the 23! The boat was very shortly with another buyer who did some detail work and removed a few decals...I am assuming the TNT ones were removed then, I'll have to look closer next time to see if they are still visible in the gel coat. I think this engine will be good, there is an hour meter that reports 789 hours, if this is accurate I am not sure but as I mentioned the compression is great. If the boat works out as well as I hope and sounds like it should, I plan on re-powering sometime in the fairly near future unless this engine is better than expected! Also, the wood doesn't concern me much either, the boat is extremely clean throughout and is solid as a rock on the floors, transom and engine stringers, I don't see any issue up front and if I keep it dry and clean I don't foresee anything randomly popping up. But hey it is a BOAT, we all know what that can mean! Thanks for the info and looking forward to getting on the water! Yes, it is TNT. Here's a picture from the eBay posting with the "TNT" decal still on it. Note the registration numbers are the same, as well as the trailer it's on. And here's a post I made about it back in May. Well, a boat project has taken many many more hours, days..years than expected! If you all could imagine! We've enjoyed our first full season aboard our '77 2300 Hardtop! This boat has been rock solid and ran like a champ after a thorough engine overhaul/update. Z' Life will be going strong for a long time to come. Now, a few things to chat about this offseason: 1. Issues with saddlebag fuel tanks. 2. Trim Tab balance/ride comfort 3. Canvas solutions/options to repair/replace existing original canvas top. Wow! This thread has risen from the dead! Great to see it out on the water being enjoyed! So pray tell, what have you done these past three years? I know that Bud (who has passed away) and Thelma would be very happy to see their boat (TNT) very well taken care of and being used to have fun! That's awesome! Too bad you couldn't bring it to the rendezvous, maybe next year?? Great pics and always good to see a Glasply risen from the dead and getting used! 1. Removed the carb and sent to Edmonds Marine and Auto parts store for rebuild...excellent work! 6. Found bent pushrod on #8 cylinder, showed some water intake/rust at some point even though oil was clean but after the engine sat for so long I think that it corroded in place and bent as we finally fired up the engine. 9. Multiple new pieces of hardware throughout...which I found they still make most of the exact same chrome plated stuff in same footprints! Bud and Thelma clearly took excellent care of this vessel and I am proud to take her into the next generation of fun! Our new name for TNT is Z 'Life, because we have a boating family and across the 4 siblings and our parents we have 6 boats plus two sit down jet skis...and I help maintain/care for each of these (minus major issues) so this Glasply is my relaxing/getaway boat and it is "the life" to be out in the islands, fishing, crabbing, camping and just cruising...hence Z 'Life. As of now, we've put 92 hours on her, so I feel pretty good about putting even more time in next year!! Looking forward to connecting more and yes, Rendevous 2019 we will be at (we're moored in Cap Sante). We missed this year because that was our long weekend away to Jones Island, Sucia and ended at Cypress Island. Outdoorzman, nice ride! Similar to my 23. Could you post a closeup pic of the dark side cabin window. Looks like it was replaced. Cummins12V98, Thanks, love this boat! Need to figure out one of the trim tabs though as can't get her to ride level...which the kids and ladies don't like! I'll be out to boat this weekend so will get a pic then. Is it the stbd side window in the forward cabin you're looking at?